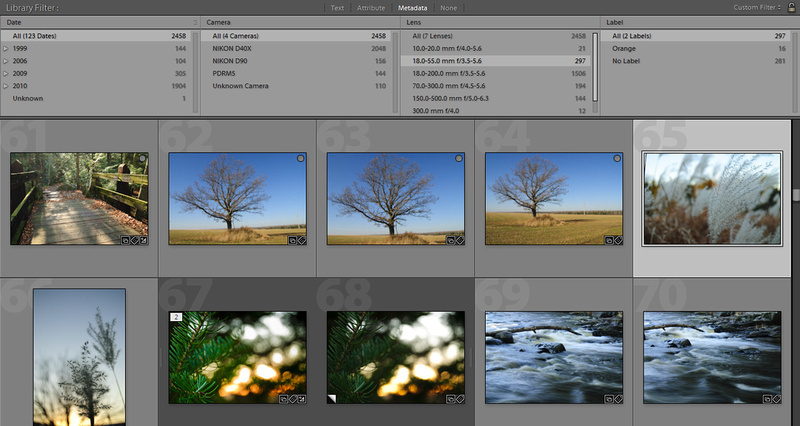 Over the last several weeks we've reviewed many of the options in Adobe Lightroom 3 's Library Module. This week I wanted to show you a quick way to access images in your catalog that share similar attributes to the image currently being viewed in the Library Module. We've already used this method to see images that share keywords, but what if you were trying to find all of the images taken with a particular camera or maybe a certain lens? From the Metadata Panel, you'll notice the right arrow icon appearing to the right of many of the data elements just like the one circled in red in this screen shot. By clicking on one of these arrows, you'll automatically bring up the Library Filter with that particular attribute already selected. For example, when I click the icon circled in the screen shot, the library filter appears showing me all of the images in my library that were shot with the 18.0-55.00mm f/3.5-5.6 lens. Well, that's all for this week. Join me next Tuesday when we step out of the Library and into the exciting Development Module! It's where the magic happens.